View modes, grid, list, sort modes, alphabetical, custom, by date, etc. You can choose among several viewing and sorting modes to customize the way you view your assets inside a collection in Pics.io. Two buttons in the top left toolbar of the the main Pics.io screen help you switch between the modes. The Grid view mode will present your assets as rectangular thumbnails on the screen, which is more convenient when you need more visual information about your assets. The List view mode shows your assets as a list, with a small preview image on the left and control buttons on the right. This view mode brings more metadata to view. It is also suitable for batch processing of files and is crucial for mobile interface. Try both view modes and choose which mode works better for you. Upload time - sort your assets by the time they were uploaded in Pics.io. Create time - sort your assets by the time they were created (the date stated in corresponding metadata field). Rating - sort your assets by their star rating. Color - sort your assets by color labels in the following sequence: blue, green, no color, purple, red, yellow. Or in the reverse order. 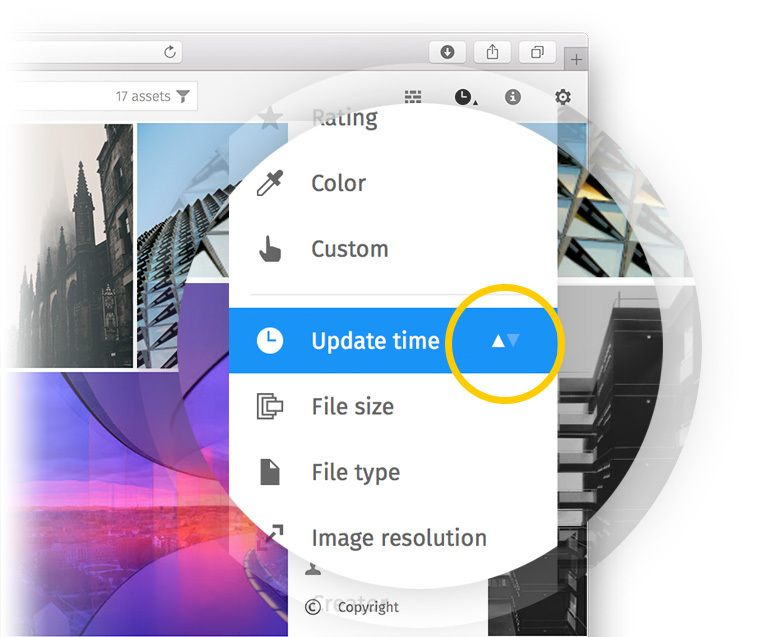 Update time - sort your assets by the time they were modified (changed attribute, added revision, commented, etc.). File size - sort your assets by their size (the value stated in corresponding metadata field). File type - sort your assets by file type (the names of the file extensions are arranged alphabetically, e.g. doc, jpg, pdf, etc). Image resolution - sort your assets by their resolution (the value stated in the corresponding metadata field). Creator - sort your assets by the name of their creator (author) in the alphabetical order. Copyright - sort your assets alphabetically by the name of the person or the company who owns the rights for this asset. The above mentioned sorting modes can be applied in two directions: direct and reverse. You just need to choose the direction of the arrow next to the sorting option you've chosen. There is also one distinct sorting mode that does not imply a pre-defined sequence. With Custom sorting mode you can arrange your assets deliberately by manually dragging them. Does the sorting mode I choose apply to all my collections in Pics.io? Sorting modes can be applied to collections and saved searches, and they are saved separately for each collection and user. Custom mode is an exception here, as it is only available for collections, and unlike other sorting modes, it works across the team. Another great thing about sorting modes is that when you create a website on top of a collection, the sort mode you applied to this collection will be saved in the website.